audience. 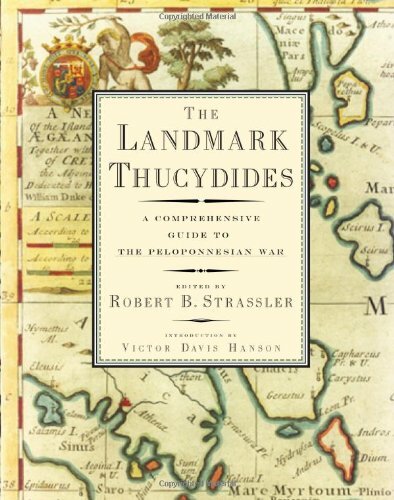 Based on the venerable Richard Crawley translation, updated and revised for modern readers.The Landmark Thucydidesincludes a vast array of superbly designed and presented maps, brief informative appendices by outstanding classical scholars on subjects of special relevance to the text, explanatory marginal notes on each page, an index of unprecedented subtlety, and numerous other useful features. In any list of the Great Books of Western Civilization,The Peloponnesian Warstands near the top. This authoritative new edition will ensure that its greatness is appreciated by future generations. Robert B. Strassler is an independent scholar whose articles have appeared in theJournal of Hellenic Studies. He holds an honorary doctorate of humanities and letters from Bard College and is chairman of the Aston Magna Foundation for Music and the Humanities. He lives in Brookline, Massachusetts. Andrea L. Purvis holds a Ph.D. in classical studies from Duke University and has taught in Duke University’s department of classical studies. She is author ofSingular Dedications: Founders and Innovators of Private Cults in Classical Greeceand coauthor ofFour Island Utopias. She lives in Durham, North Carolina. Victor Davis Hanson is the military historian who is a professor of classics at California State University, Fresno. He has written several popular books on classic warfare, including "The Other Greeks", "Who Killed Homer? ", & "The Western Way of War". He lives in Selma, California.